Soft, well-structured, and durable, you ll definitely love being the proud owner of this United Colors of Benetton T-shirt. This black piece can be teamed with cuffed chinos and canvas shoes when you re meeting the guys for drinks. 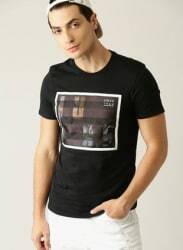 Black printed T-shirt, has a round neck, short sleeves.